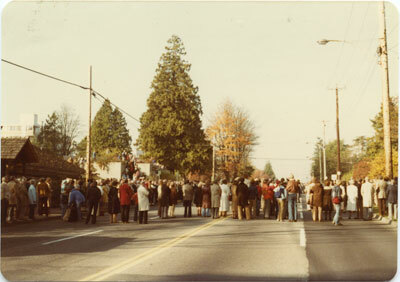 View of large crowd gathered in front of West Vancouver Memorial Library for Remembrance Day Ceremonies, Marine Drive. Scanned December 2011 using Epson Perfection V700 Photo at 300dpi and 100% of original image size. Alternate Versions: Lossless TIF from original scan at 300dpi and 100% of original print. W12 x H9 cm colour print on photo paper.